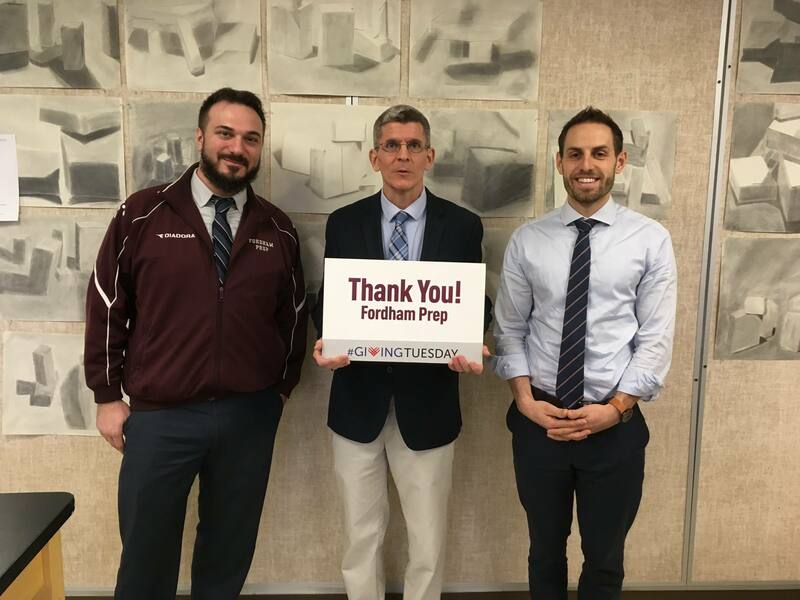 Fordham Prep's students, faculty and staff thank you for yet another record-breaking Giving Tuesday campaign. 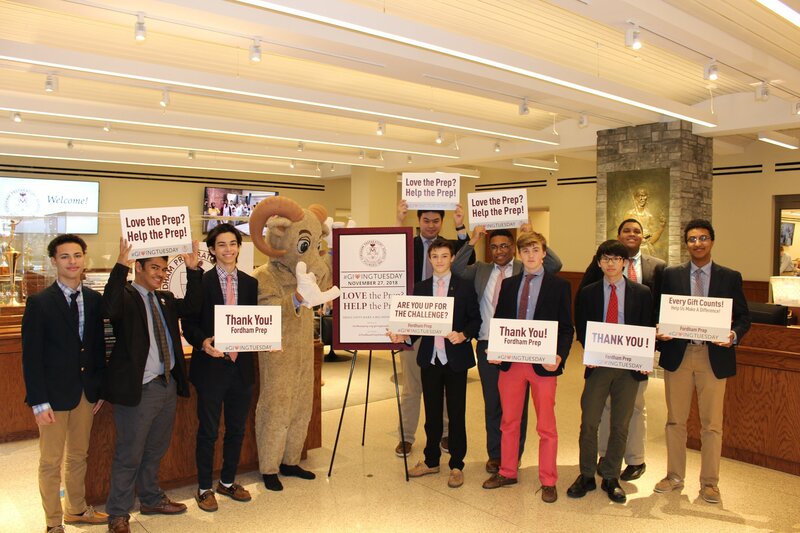 The Prep totaled $176,575 in donations and pledges from 348 different donors, a 35% increase in donors over last year. As we approach Advent and later Christmas, let us allow this spirit of generosity to fill our hearts and continue to drive the Fordham Prep mission. Thank you for your generosity. Below is a recap of our Giving Tuesday social media posts. 7 am: Who will be the first person to donate to the Prep on Giving Tuesday in support of our students, their educational opportunities, and the campus enhancements for the East Wing Project? 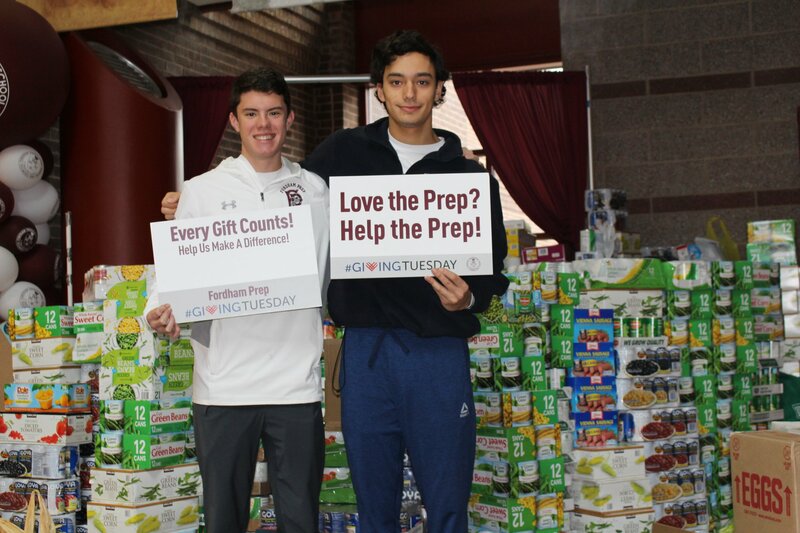 In the spirit of generosity, two anonymous alumni donors will contribute $20,000 to the Prep if we receive 20 gifts by the end of class period #2 (that's 10:06 am). If you love the Prep, we hope you'll join us and help the Prep. 8 am: Our Principal, Dr. Petriello '98, greeted students this morning and wants you to know that these young men, whether they are on or off campus, are always willing to share their time and talents in service to others. Support our Jesuit mission of faith, scholarship, and service. 9 am: The Great Ignatian Challenge motivated our students to collect nearly 28,000 pounds of food (that's 14 tons!) to help feed our neighbors at POTS, Concourse House, Mercy Center and Our Lady of Assumption Food Pantry. Hunger Awareness Co-Chairs, seniors Ryan Fodero and Luke Mathison, led the effort with contributions from every mentor group. 10 am: THANK YOU! We've already surpassed our first goal of the day and secured the alumni challenge match gift of $20,000 for the Prep! Not to be outdone, four sets of Prep parents - one each for the Classes of 2019, 2020, 2021 and 2022 - have stepped up to offer today's second series of challenges. They will each donate $10,000 if 20 of their fellow class parents (or grandparents) donate to the Prep today. The class that reaches the goal first will get bragging rights and a special prize! 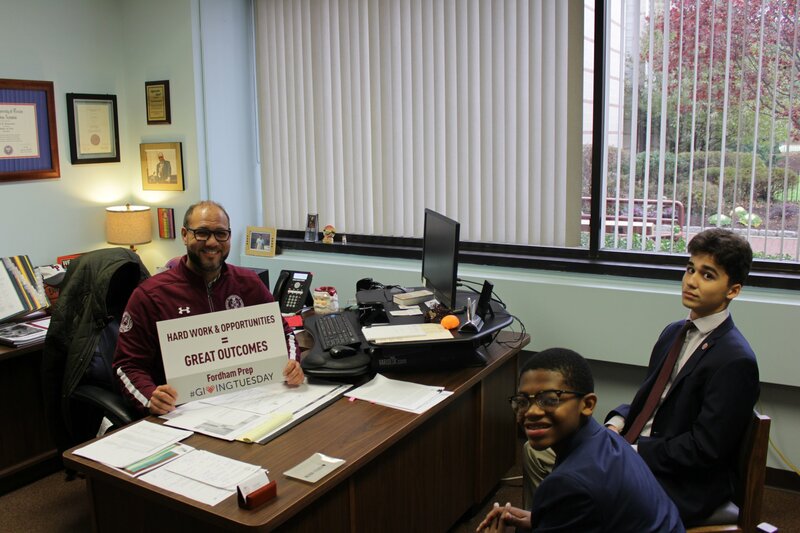 11 am: Assistant Principal for Academics & Student Life, Mr. Broussard invites you to join our Giving Tuesday effort and reminds us that Prep students are diligent, hard-working and focused on their education. As an added incentive, if we receive 25 gifts before lunch today, Mr. Broussard has offered to share his prized Louisiana Creole Gumbo recipe in time for your holiday celebrations. Trust us, the faculty has tried it and we know it's good! 12 pm: It's lunchtime in the Commons and these students have joined today's Giving Tuesday challenge. They want you to know that every gift today will impact the entire student body, so a gift of any amount can help. 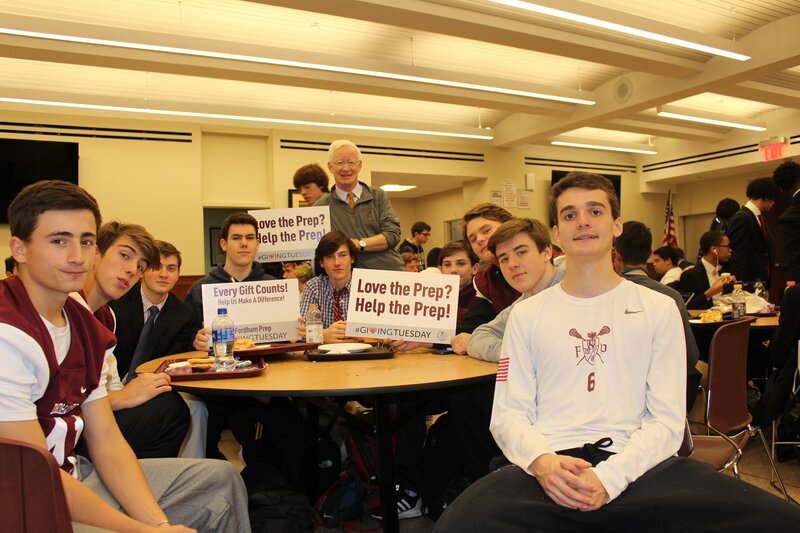 Before you head out to lunch, partner with these students and make a gift to the Prep. 12:30 pm: Great News! 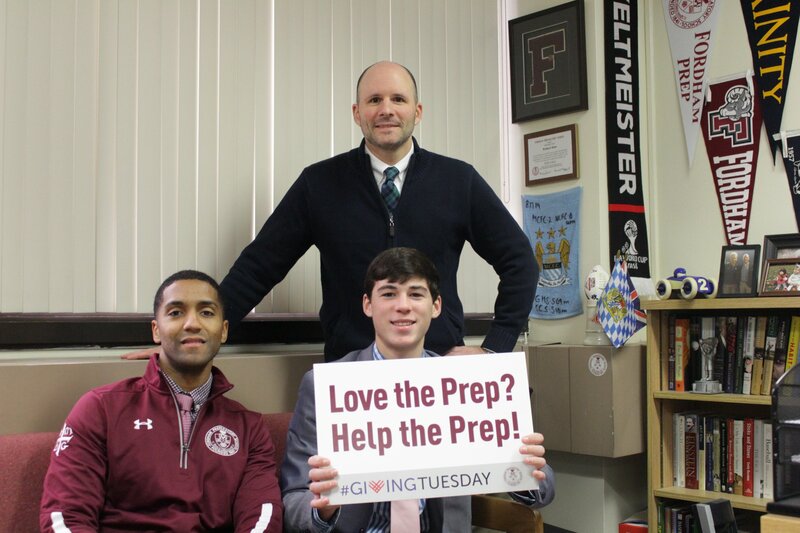 We're delighted to announce that an anonymous donor has generously offered to donate $50,000 to the Prep if we receive 100 gifts before midnight. 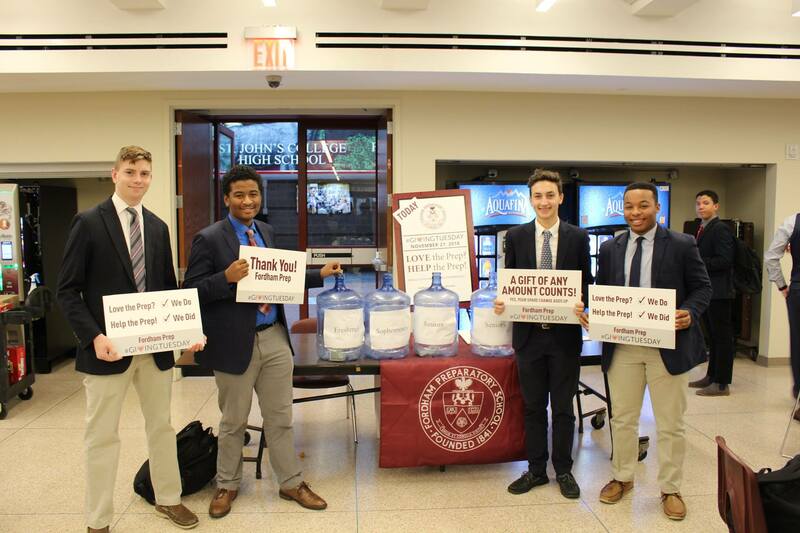 Come together for Fordham Prep and see what your generosity can do. Let's crush it! 1 pm: Remember JUG? 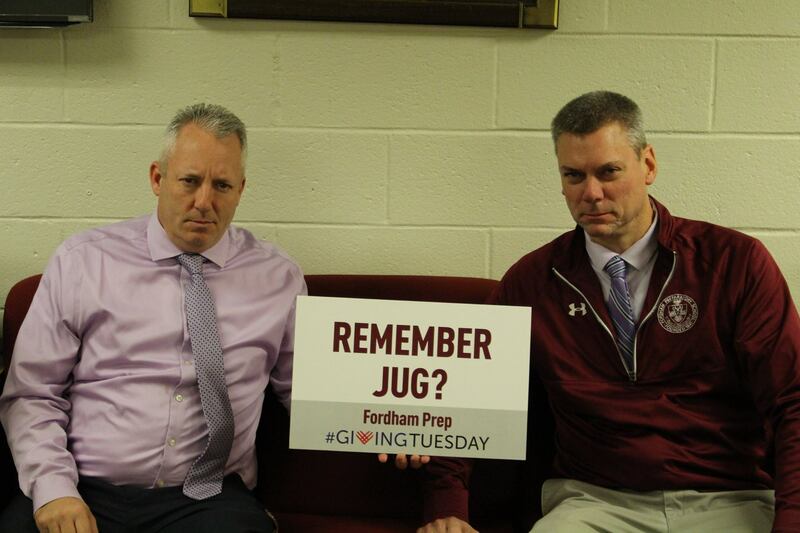 Mr. Pettus, Mr. Deane and Mr. Mercorella are offering a special deal just for today, a one time only "get out of JUG free pass" for every donation made to the Prep between now and 6 pm. 2 pm: Stop the presses! Senior Stephen Thomas, one of the leads in the Prep's recent production of "Newsies" wants to share with you why he supports and gives back to the Prep on Giving Tuesday. Will you join him? 3 pm: The Ram appears to be envisioning the building enhancements planned for the east side of campus, which will be breaking ground in March. Students and faculty are looking forward to the renovations and appreciate the ongoing support of the Prep community in making it happen. 4 pm: Our sports teams are always ready, and last week's Turkey Bowl against rival Xavier was no exception as Fordham Prep beat the Knights won 21-13. Our seniors hope you'll help us come out on top again today with a gift to support the Prep. 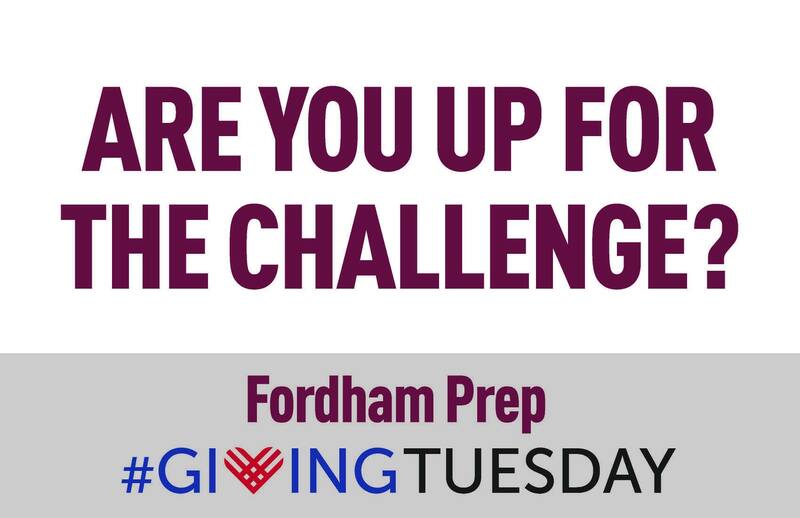 4:30 pm: Each Fordham Prep class (Classes of 2019, 2020, 2021 and 2022) is nearing 20 parent/grandparent donors which will unlock an additional $10,000 gift per grade for the Prep. Our new food service, Aladdin, just sweetened the challenge by offering to provide their popular giant chocolate chip cookies to all students in the first class that hits the goal. In addition, everyone in the winning class will be entered in a raffle to win free lunch at the Prep - every school day from January to May 2019! Love the Prep? Help the Prep! 5 pm: Student Ambassadors, supervised by the Prep's Admissions Director Brad Serton and Associate Director Cory Punter, host potential students during Ram For a Day visits each year. Ambassadors like sophomore Luke Daly love sharing their experiences and enthusiasm with future Rams. If you feel the same way about the Prep, show your support and make a gift. 6 pm: Senior Student Ambassador Bryce Collings is everywhere at the Prep. He's in the Jazz Band, Drama Society, UNICEF Club and runs track. He loves the Prep and wants to tell you why. 7 pm: After classes ended today, students gathered in the Commons to say thank you to those they know - their parents and friends - and those whom they have never met - alumni and alumni parents - who are connected by their love and support of Fordham Prep. To a man, they all plan to pay it forward and be generous in giving to the Prep. 8 pm: Fine Arts Department Chair Mike Weldon and faculty members Jeff Butkowski and Dylan LaGamma want you to know that Prep students are academically and artistically talented, motivated and always willing to share their time and talents with others...true men for others. The Fine Arts faculty, all of whom are Prep graduates, appreciate your support of our Jesuit mission of faith, scholarship and service. 9 pm: Young alumni are getting into the Giving Tuesday spirit as well! Myles Nuzzi '17 took some time to send his fellow Rams a message from the library stacks at Georgetown. There's still time for our college age alums to make a gift - in any amount - in appreciation for the education they received and the friendships they made during their time at the Prep. 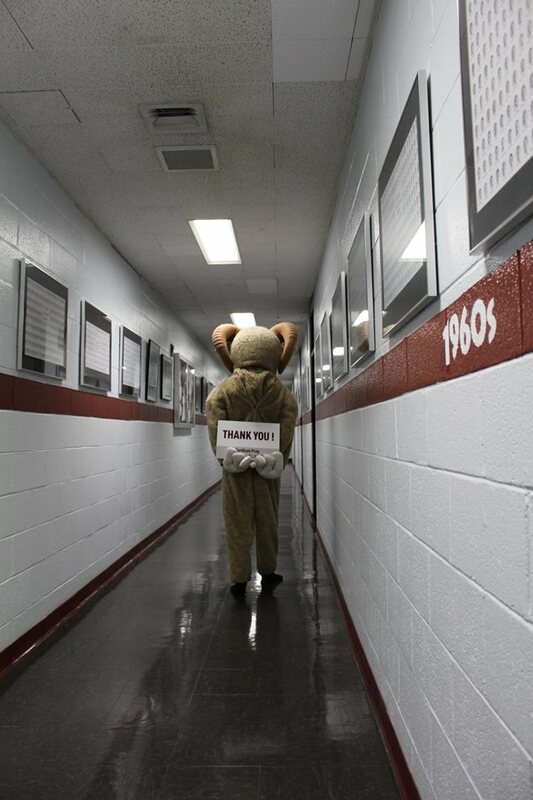 10 pm: The halls of Fordham Prep are now quiet and there are only two hours left to make a Giving Tuesday gift. Please join the over 250 parents, alumni, grandparents and friends whose donations today will help to provide exceptional experiences to learn, lead, and serve for all our students. 12 am: Thank you to everyone who took part in our Love the Prep? Help the Prep! Giving Tuesday campaign! We are honored and touched by the generosity of the Fordham Prep community and its commitment to our students. We are currently tabulating the results and will report them as soon as possible. Thank you for supporting Fordham Prep! #ISupportFP.